Opportunities abound on this delightful river cruise vacation to learn about France and the French. Your adventure begins with two overnights and guided sightseeing in Paris, then take the high-speed train to Dijon and continue by motorcoach to fascinating Beaune for a visit of Hôtel-Dieu. Next, board your river cruise ship in quaint St. Jean de Losne and set sail for lovely Seurre, France’s gastronomic capital of Lyon, as well as medieval Tournon, charming Viviers, Avignon, and Arles. Daylight permitting, sail into the peaceful Camargue area. Disembark your cruise ship in Arles and transfer to Aix en Provence for the start of your Monograms extension. With two overnights, enjoy guided sightseeing with an expert Local Guide, and visit the Cathedral of the Holy Savior, known for its mishmash of architectural styles. This was Cézanne’s hometown, and in your free time, you may want to take a tour following in his footsteps. Finally, we’ll whisk you via high-speed train to Nice for your final two nights in France. Here, you’ll walk through the Old Town and the Promenade des Anglais, Nice’s most famous boulevard. In your free time, perhaps take an excursion to Monaco, St. Tropez, or Cannes-known for its famous film festival. In both cities, we provide the services of Local Hosts®-a “friend in the city” to answer questions, share inside information, and help arrange your activities and excursions. Visit Arles, one of the Mediterrean towns featured in Van Gogh’s paintings. Located in Southeast France on the Rhone River. With a population near 90,000, it is a wine producing and manufacturing area. Famous Gothic church and many other historic sites are located in the city. At the merge of the Rhone and Saone rivers, Lyons is in east central France. Founded in 43 BC by Romans, it is famous for its silks. Nice (nês), city (1990 pop. 342,439), capital of Alpes-Maritimes dept., SE France, on the Mediterranean Sea. This famous French Riviera resort relies mostly on tourists, but electronics and other manufactures are important. Nice probably originated as a Greek colony in the 5th cent. B.C. Sardinia held it from 1814 to 1860, when a plebiscite gave it to France. It lies just west of Monaco and enjoys moderate weather during the winter months and lovely warm weather in the Spring and Summer. 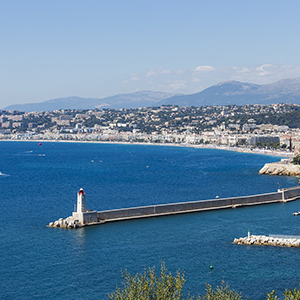 Whether you are just driving through or staying, Nice is a very nice place to stay! Many great hotels and restaurants are to be found along the coastline and in the surrounding hills overlooking the Mediterranean. Provence is known for its serene beauty and fine cuisine. A beautiful, secluded city along the Rhone River. Prices are per person, land or cruise only, based on double occupancy. Offer subject to availability and change without notice. Some restrictions may apply. Please ask us for details. Charges not included in the land vacation price: airfare to and from the start of your vacation; airline baggage fees including checked and/or excess baggage fees; Federal inspection fees for the Federal U.S. Customs and Immigrations; agricultural tax; other per person taxes imposed by government entities; applicable cruise taxes, fees, fares and port charges; passports; visas and vaccinations; transfers; tips to your Tour or Cruise Director, Local Host, driver, Local Guides, and/or ships’ crew; gratuities on ferries, trains, and cruise ships; laundry; telephone; minibar; alcohol, beverages, and food outside of the contracted menu as presented at a hotel or restaurant (these extra items will be billed to you before leaving the hotel, ship, or restaurant); additional excursions and activities not listed as ‘included’ in the itinerary; porterage at airports or train stations; Travel Protection premiums; and all other items of a personal nature.